Relieve your stress on your foot, the beginning of your movement! Foot is the beginning of your movement, so it also stands your weight. The pressure on your foot is more than your expectation. Especially heel and arch receive more stress. 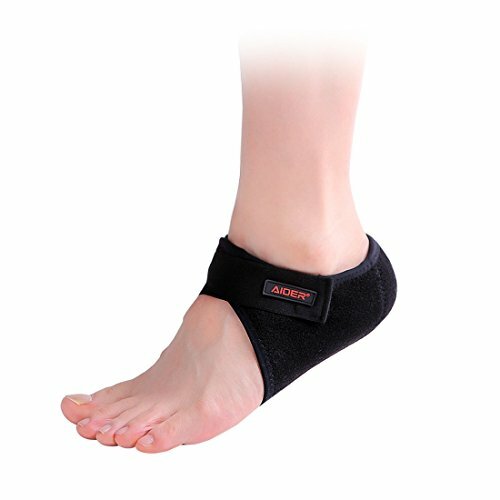 By absorbing stress on your foot, AIDER heel pad can reduce pressure. AIDER heel pad is designed by sole pattern.Even if you wear it for long time, it is minimalized feeling of irritation. For applying your daily life, thin area is thinner, and cushioning area is applied enough cushioning. It is applied more than three kinds of fabrics. There are a lot of requirements in such a small support. Some users could be grazed by Velcro or damaged by product. If you wear it for long time, it is also easy to sweat or make prickly heat. AIDER always tries to apply better material and reduce side-effects by material. ☞Neo prene, Magic Velcro(Anti-grazing Velcro), Span Velcro, Elastic Nylon Band are applied. AIDER released two-type-Heel pads. We wish our solution is helpful for diverse people. The circumference of right below malleolus is under 250mm. Please refer picture. The repeated damage on your heel causes to lose your fat on heel and reason of plantar fasciitis. Especially high heel or no-embossed shoes gives you stronger damage. Applied thin materials, so you can wear AIDER heel pad inner socks or shoes. AIDER's heel pad is gathering your fat on heel. It makes your heel embossed and absorbing damage. This structure can minimalize damage on heel. Now do not feel painful on your daily life! If you have any questions about this product by Aider, contact us by completing and submitting the form below. If you are looking for a specif part number, please include it with your message.